72% of UK businesses believe their fleets will be fully electric by 2040, according to a new sustainability report. 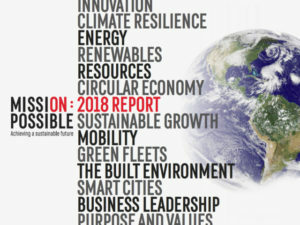 The report, titled “Mission Possible” by Edie in association with E.On, showed that fleets are open to fully electric cars replacing petrol and diesel vehicles, with 8% believing they’ll be fully electric in two years by 2020, and a further 41% by 2030. A further 23% thought they’d be fully electric by 2040 – the date by which the UK Government plans to annul sales of conventional petrol and diesel vehicles. However, 16% believed they’d switch to fully electric by 2050 and 11% after that date, indicating other fuel sources for vehicles will still have a large role to play for many fleets. A further 34.5% of businesses surveyed said that ’employee behaviour change through telematics’ would be in their top two ‘sustainable mobility opportunities’ along with 29.5% stating ‘smarter business travel through technology’. PwC’s sustainability advisory leader Clinton Moloney said: “Indeed, our own research has found that electric and hybrid vehicles are likely to account for 58% of all new car sales in Europe, the USA and China by 2025. The report explored the key commercial drivers, challenges and opportunities on the road to a low-carbon, resource-efficient planet.